and synergistic to periodontal treatments. - endodontic treatments of infection with or without periapical reaction. During the 80’s Conservative Dentistry has become aware of the considerable number of failures of previously-applied fillings. - ENDODONTIC RETREATMENT of already-treated canals has become an ever-more recurrent term at the most prestigious congresses of Endodontics. - The main cause of apical and periapical pathologies is the presence and/or passage of toxic substances from the endodont to the periodont; thus the principal aim of Endodontics is the perfect and TOTAL disinfection of the endodontic space. - The complex anatomical configurations of canals and apices, and the extreme and uncontrollable variability of these anatomies set limits on Endodontics and are the cause of many cases of failure with which every dentist is faced daily. IONTOPHORESIS in these cases responds to the need for a TOTAL disinfection which is biologically compatible and well-tolerated; this process is the ONLY ONE which permits the total sterilization of all the canals, whether the main mechanically inaccessible ones or the secondary ones, numerous and aberrant, in a biological and non-traumatic way. The scientific content of ion therapy has been recognized and undisputed for more than a century, although it has been little used because of inadequacy of equipment, the operation of which always proved imprecise, impractical and very laborious. The construction of various types of machines, prior to the recent electronical devices, was very expensive, and the machines did not enjoy a wide market, thus discouraging producers and not favouring customer demand. Such a situation of lack has always moved medicine producers to encourage scientific information in this direction, right up to the present day; today the era of the computer uses technology to simplify and elevate historical values, and thus those of ancient ion therapies and brings them back into daily routine with new simplicity of use. 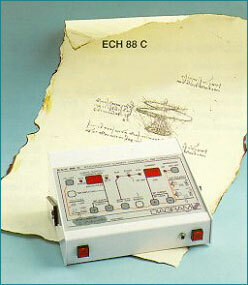 “ECH 88 C”, acronym of ENDODONTIC CARRY HYDROXYL 1988 COMPUTERAfter more than two years of research, collaboration and experimentation with important Italian and European University Dental Schools, ECH 88 C was conceived to overcome efficiently all the situations and different resistances, which may be encountered. From the point of view of electronics, it is from the most advanced generation, a natural evolution from the series CF 85 C (CARRY FLUORINE 85 COMPUTER), of which the project philosophy was already directed towards extreme simplicity and security of use, allowing it to be operated easily also by the Assistant Hygienist. - Possibility of setting the MEDICINAL THERAPEUTIC DOSE, that is, the quantity of electricity (or ions) to be applied and the interdependence of this programmed DOSE with the flow of current applied to the patient, and likewise with whatever variations on this flow might occur during the course of treatment. As a result the times necessary for application of the therapeutic dose during the current flow and, its variations, will be obtained automatically. - TIME DISPLAY, for the checking of remaining treatment time in units of minutes (because the therapeutic dose is always indicated in mA/min. in compliance with all existing scientific literature on the subject). - POLARITY INVERTER, operated by a button protected against accidental activation and illuminated when positioned in the least frequent operation mode. * in the case of the patient’s resistance being too high, and thus having to switch to a higher voltage value. - LOW/HIGH VOLTAGE: voltage change150/300 Volts when a high resistance in the patient is encountered (e.g. calcified tooth, hand with dry skin and high resistance). - MODULATION: the continuous exit current, normally stabilized, may be modulated with a slow frequency to improve the physiological efficiency of the iontophoresis treatment. - STAND BY: to interrupt the treatment briefly (always by means of SOFT) while maintaining in the computer’s memory all the parameters of the moment; on reactivation all these parameters return to functional mode. - Different acoustic signals for all operational and alarm modes. Control panel with all keys “sensitive to touch”; a red line indicating logically connects these; an ergonomical and logical-operational progression for the sequence of the various automatic functions of the machine. == FUNCTIONALITY SOLELY AUTOMATIC, COMPUTERIZED and governed by a microprocessor programmed in EPROM which controls the interdependence between the Quantity of Electricity and the Current Intensity; the Quantity of Electricity, which is the Therapeutic Dose fixed by the operator, after the beginning of treatment, will diminish slowly and constantly in accordance with a time determined by the chosen current flow: this translates into a progressive decrease of the fixed mA x min, value until the end of the treatment taking into account the Current Intensity tolerated by the patient and relative higher or lower adjustments made by the operator. On the automatic Stop of the treatment, the total time of the same treatment will be the total sum of all the times, short and long, correspondent to the various currents used to apply the entire Therapeutic Dose. - Electrical Supply: high-capacity rechargeable dry-lead battery. - External battery-charger, doubly insulated and in compliance with the Safety Regulations of various countries. - Led indicators for control of maximum and minimum battery charge level. - Protection of battery against over-charging. * Current Intensity, which can be continually adjusted during the treatment. - Exit: Direct current, constant or modulated, by a jack-plug. 1 TMJ electrode for TMJ, trigeminal disorders,etc..
Medicaments may be supplied in the form of liquid or gel.